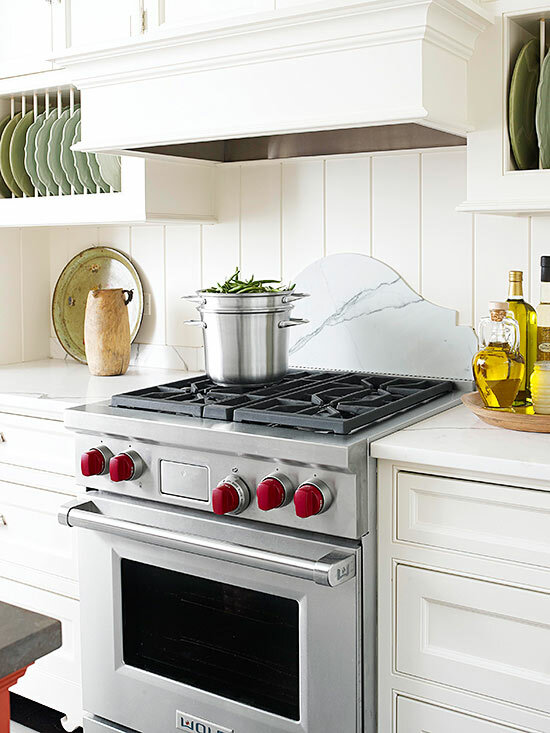 Apart from being a key functional element, backsplashes are a way to add color, texture, dimension, visual interest, and personality to any kitchen. Furthermore, a new backsplash can completely transform the look of the space. From the classic subway tiles to stone to metal to mosaic to glass, the options in terms of materials, sizes, shapes, and designs are literally endless and anyone can find a solution that best fits the style of the kitchen. Stainless steel and brick backsplashes are also solutions to consider. When creatively and tastefully done, any backsplash can immediately become a focal point of the space. Using ornate patterns, insets, niches, reclaimed handmade tiles, and more is a way to add Old-world charm, drama, and character. Extending the backsplash from the countertops to the ceiling creates a sense of height. Incorporating recycled and reclaimed materials is a low-cost option to both create unique backsplashes and go green. Generally, whatever the material and design, when approached with creativity, backsplashes can bring any kitchen to life. 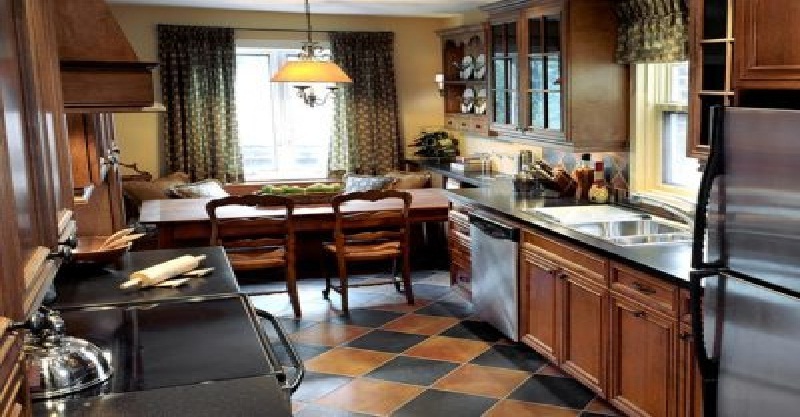 Ceramic tile backsplashes are an affordable, common choice. As they come in a myriad of options in terms of colors, designs, shapes, and sizes, it is not that difficult to find a solution that fits in with virtually any kitchen style. Ceramic tile backsplashes are easy to install and offer versatility, durability as well as stunning customizable solutions. In addition, when it comes to adding texture, pattern, visual interest, appeal, and personality to any kitchen, they definitely are a popular choice. Whether with a glossy or matte surface, stacked horizontally or vertically, staggered, or laid at an angle, ceramic tile backsplashes can be a stunning way to introduce bold colors and designs, create focal points, and dress up the space. Matching multicolored backsplash and island countertop lend a harmonious look to the above-shown kitchen. Hanging pot rack adds extra visual interest and personality. 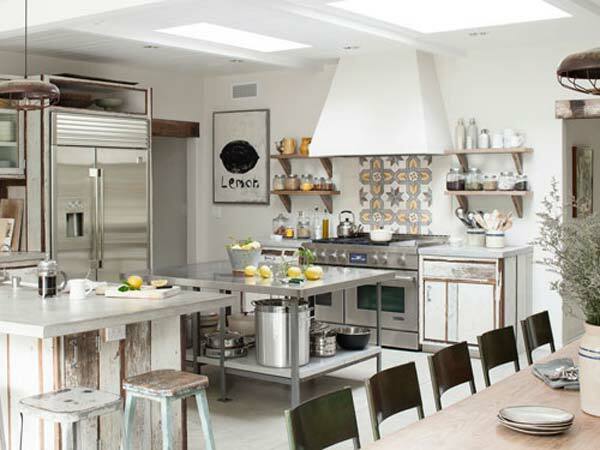 In the above-shown picture, a jaw-dropping eat-in Industrial-style kitchen. Pops of yellow enliven the space. Reclaimed barn wood adds warmth and a sense of age. 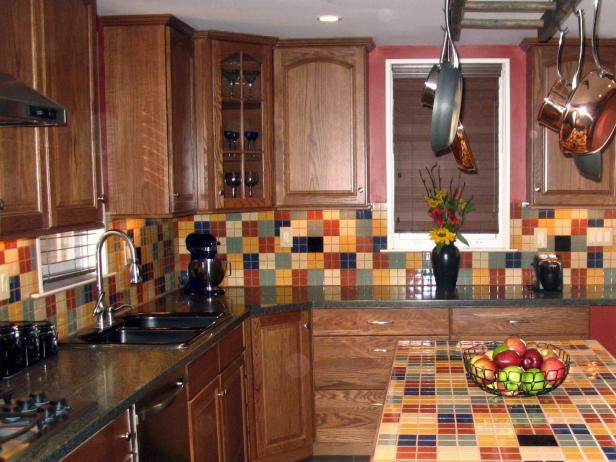 A Moroccan-style backsplash offers a stunning way to bring color, texture, and pattern. Definitely a space with charm and character! Beyond doubt, subway tile backsplashes are a classic, timeless option, which works well in any kitchen style. Their simple rectangular shape and light grout are immediately recognizable. Generally, they come in a variety of sizes, from small to medium-sized and can be found in an endless range of color and materials, from ceramic to glass to marble and granite. In the picture above, a white subway tile backsplash is the perfect background for the red appliances and accessories and the mint green countertop. A truly impressive space with a vintage vibe! Natural stone backsplashes, whether marble, sandstone, granite, slate, travertine, and even river stones work perfectly well in traditional and country style kitchens. However, when it comes to contemporary-style kitchens, especially marble backsplashes are an option to consider. As they offer a limitless choice of colors and textures, these backsplashes can lend a truly unique, elegant, striking, timeless look to any kitchen. With relatively affordable options, such as travertine backsplashes, natural stone is definitely a stunning way to personalize the space. Note that being inherently porous and absorb stains and water, natural stone is harder to clean than ceramic tile backsplashes. In this regard, always keep a natural stone backsplash properly sealed. Furthermore, use only hot water or stone-friendly products to clean natural stone backsplashes. 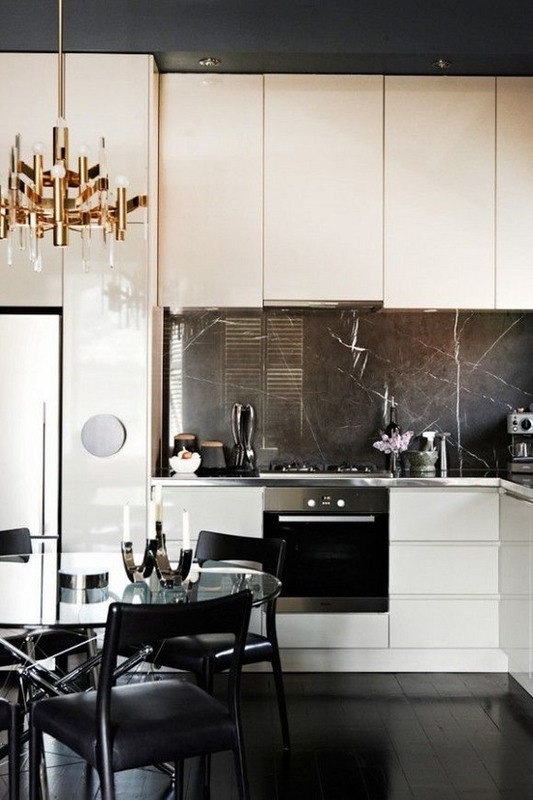 Above shown is a chic contemporary eat-in kitchen. A stunning black marble backsplash complements the flooring and dining chairs in creating this harmonious, dramatic space. A glass-topped round dining table, a glamorous chandelier, and stylish accessories add extra visual interest. 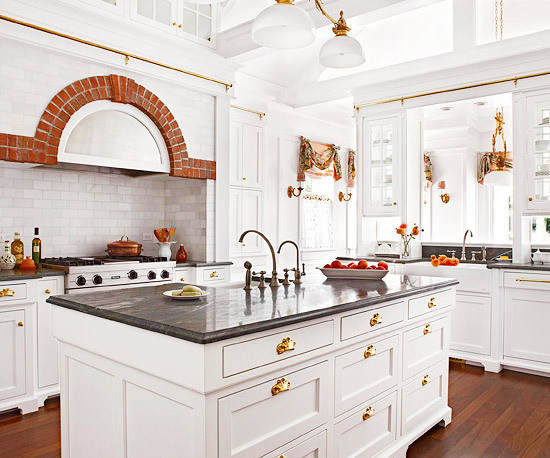 Above, a traditional kitchen with a distinctive architectural character. A white marble tile backsplash, black marble countertops, and gold hardware add sparkle and glam. Brickwork brings extra texture, color, and visual interest. Stainless steel backsplashes/whether tiles or solid panels/ complement stainless steel appliances and help create a sleek, harmonious look in contemporary-style kitchens. When it comes to kitchen remodels, this easy-to-clean, water- and heat-resistant, long-lasting option available in an array of sizes, finishes, and styles, is a solution to give any kitchen a fresh, modern look. For budget-friendly remodels, consider faux stainless steel backsplashes. Glass backsplashes/either tiles or a solid piece of back-painted glass/ offer another easy-to-clean, low-maintenance option. In addition, glass reflects light and creates a sense of a larger space. Plus, glass backsplashes are an inexpensive, easy-to-customize solution, which comes in a practically limitless range of colors. Note that recycled glass backsplashes are an option to both go green and lend any kitchen a unique look. 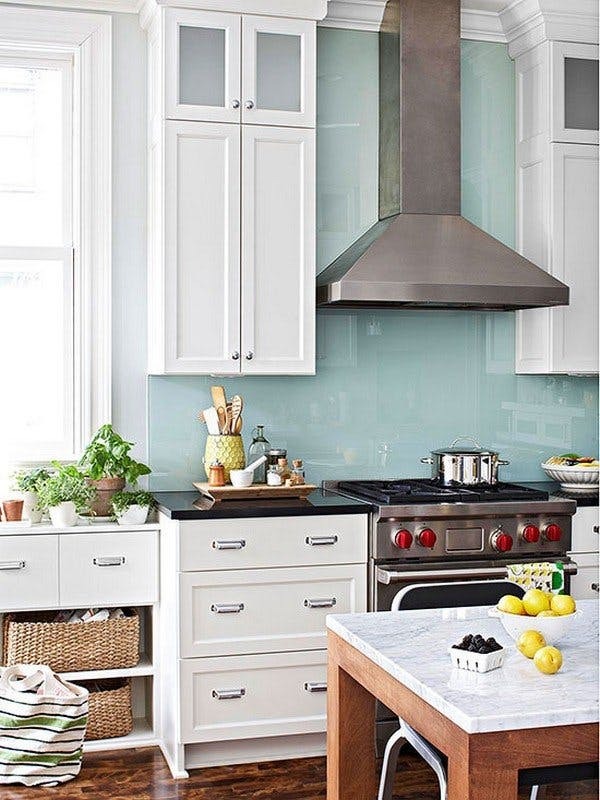 Stainless steel and glass backsplashes are a way to add extra touches of modernity to kitchens. Brick backsplashes are a solution to create a warm, cozy kitchens with a homey feel. 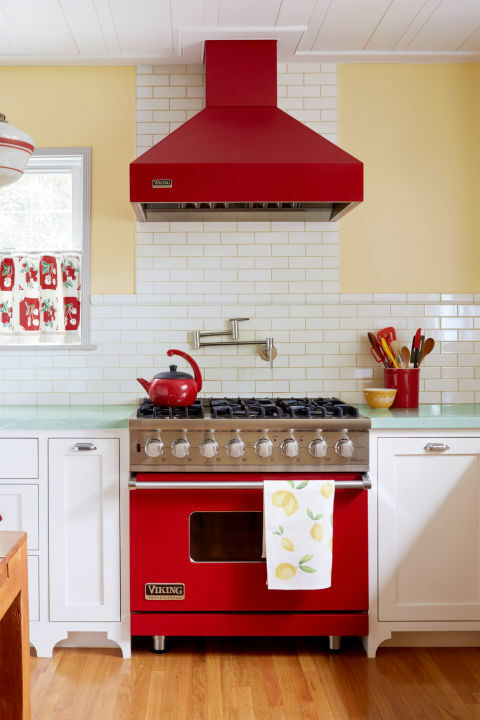 Whether red, whitewashed, or painted white, they work well in traditional, rustic, cottage-style, and Industrial-style kitchens and add undisputable charm, an organic feel, and tons of personality. In the picture above, a glass backsplash adds color, personality, and touches of elegance and modernity to this kitchen. From horizontal and vertical beaded-board backsplashes to waterproof wallpaper ones to bamboo, metal, cork, and chalkboard solutions, to reclaimed wood paneling to porcelain and terracotta tiles, to even a piece of fabric covered by a glass panel, any kind of material can be used as an alternative to ceramic tiles, your only limit is your creativity, just remember that backsplash designs go beyond pure creativity, they offer an option to add color, pattern, and texture and create focal points. In the picture above, a cottage-style kitchen with an affordable backsplash option. A marble overlay over tongue-and-groove paneling serving as a backsplash adds visual interest and touches of elegance to the space. Beyond doubt, a statement backsplash can enliven any kitchen. Actually, whether changing patterns, using bold, vivid colors or unusual materials, when approached with creativity, any backsplash can be a statement décor element. Just imagine a copper or an antique mirror backsplash! What about a raw stone one? A stained glass backsplash? However, ceramic tile backsplashes, with the literally endless options in terms of sizes and colors, also can offer eye-grabbing solutions, especially when varying patterns and playing with vibrant hues, such as a Moroccan-inspired tile backsplash. 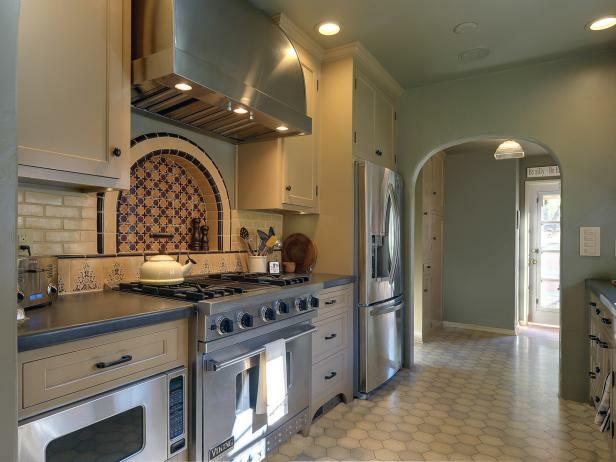 In the picture above, a mind-blowing arched Moroccan-style backsplash personalizes this contemporary galley kitchen. Note that using reclaimed handmade tile pieces as backsplash insets is a stunning way to both create a historic feel and add Old-world charm. Generally, when speaking about statement backsplashes, Mediterranean- and Tuscan-style ones immediately come to mind. With an unmistakable look, in warm, earthy colors and ornate patterns, usually made of hand-painted mosaic tiles, these wall murals are true pieces of art. 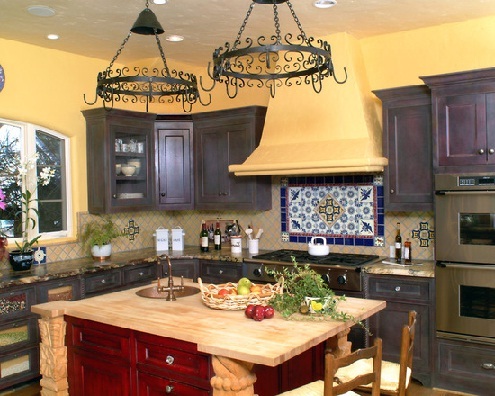 If you want to add some Old-world charm to your kitchen and create a magnificent focal point, a Mediterranean- or Tuscan-inspired backsplash is definitely a stunning yet affordable option. Above shown, a jaw-dropping backsplash in a Mediterranean-inspired kitchen. Backsplashes definitely go far beyond pure functionality. As they are a kitchen must-have element, whatever their size, material, and design, always consider them an option to add color, pattern, and texture, create a focal point, lend a unique look to any kitchen, regardless of its style, and take it to the next level.